I’m moving on from my acrylics (tired of those) and ready to move onto sharing my oils with you. I have a ton – since I’ve started painting in oils I’ve been painting like crazy – I just LOVE them! Grady walked into my studio the other day and said, “wow – you have a LOT of paintings in here – you need to have an art sale and clear this place out!”. I’m going to go back to the beginning and start there with sharing with you. You will notice a difference as I start progressing – I start finding my way after a little while and finding my voice and how I like to apply paint. You’ll start to see the paint application get much thicker with a lot of texture. I found I like thick and juicy paint. 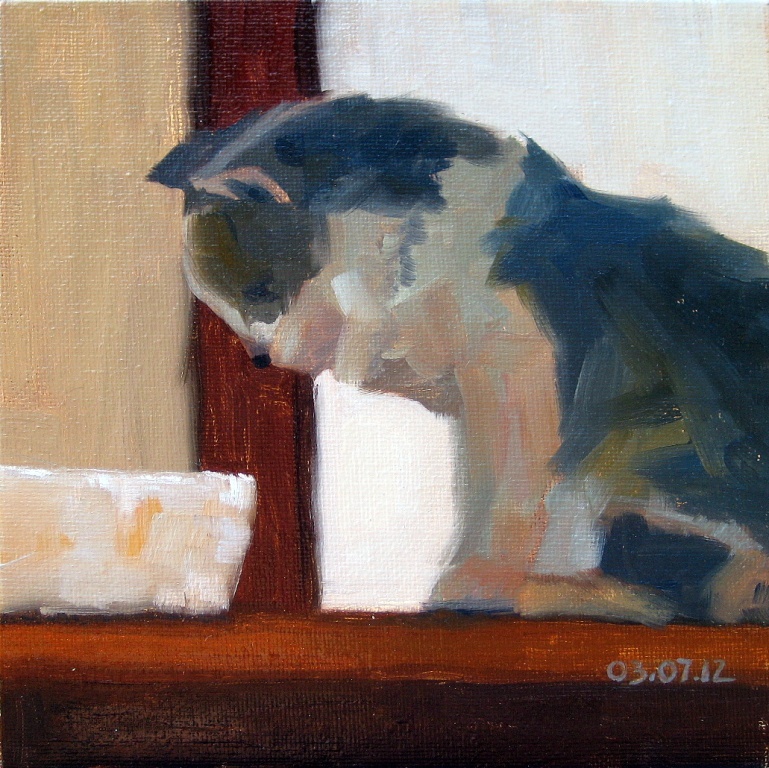 I think this was my very first oil painting I did of a little kitty and her bowl of milk. And speaking of art sale – I’ll be having one sometime in October I think. I’m going to announce a date soon to hold me accountable to having it and so you can put it on your calendar. …love this painting of your cat! Composition is great as is the paint application! Very nicely done kitty! I think you captured the essence without overdoing it. I look forward to seeing more.